This was a model from Scale Solutions, a modeling website in Australia run by a master resin-kit maker. This model came in 3 sections, wings and center sphere. 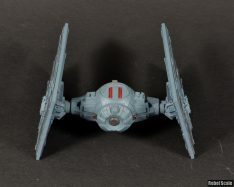 While it doesn’t have any movable features, it is in scale with the AF TIE Fighter, as it is described as being a bit smaller than the standard TIE. 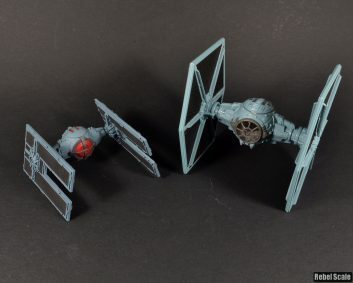 For this model, I used the blue/grey custom color I sprayed the TIE Decimator with. The red cockpit color is a red/Future mix (with a little yellow) to create an orange-red reflective tint. 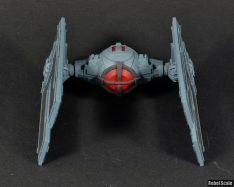 The TIE/d Automated Starfighter or TIE Droid was the Empire’s first attempt at a droid starfighter since the use of droid technology in the Separatist movement decades earlier. 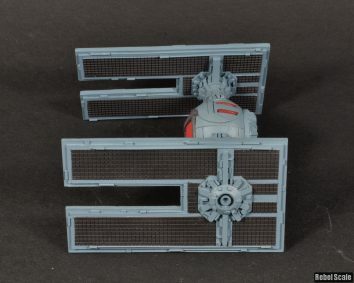 The TIE Droid featured an integrated droid brain, unlike the droid fighters of the Trade Federation, and could quickly devise new tactics on the go. 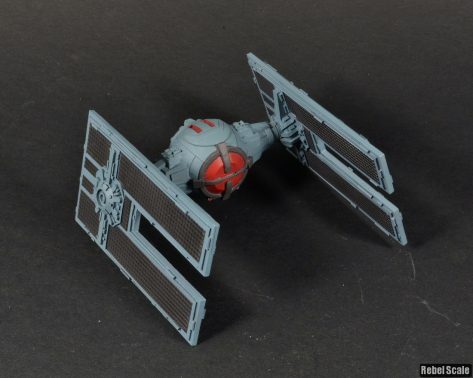 While still sporting the TIE Fighter’s two laser cannons, the TIE Droid did have better armor, a smaller profile, and more maneuverability. However, the craft was very susceptible to ion blasts and jamming beams, which the Rebels used to fight these automated terrors.